Height: Average height is 19 – 21 inches, balance is considered to be of utmost importance. With the chow’s unique construction, any deviation from the square profile could cause strain and injury to their unique construction. Weight: Can vary substantially, average weight for an adult is around 55 pounds. 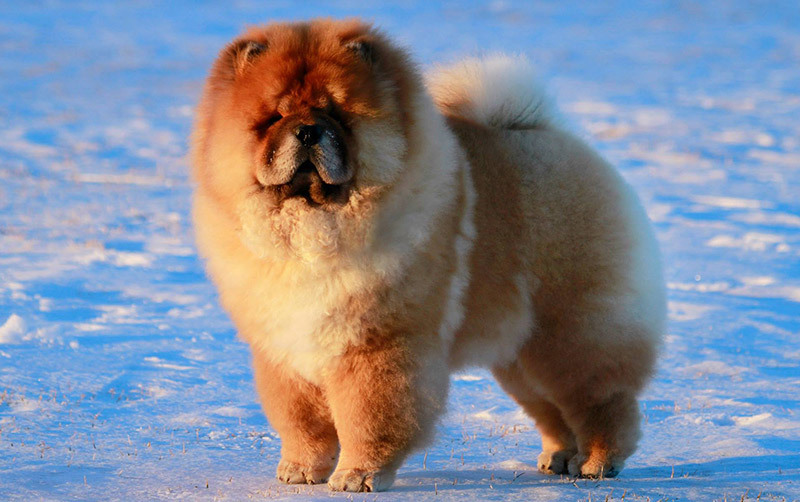 Coat: Chows come in two varieties, rough coat and smooth coat. Both are double coats. Chows shed seasonally, typically in fall and early spring, grooming is essential during this period. Chows require a fair bit of grooming; however that can easily be managed with a few tools. New owners should be given lessons form their breeder on proper grooming techniques. A shaved chow will overheat much faster than one left with natural coat. Colours: Chows can come in 5 colours, NONE of which should be considered rare. Red, black, cream, cinnamon, and blue. 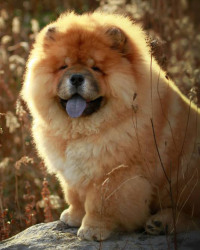 Chows have purple tongues which is unique to just a few breeds, and should be solid – not spotted. There should be never be any sable, merle, spotted or brindle patterns. Feeding: Chows do well on a variety of diets, but tend to do better with less grains. Chows tend to be quite sensitive to food ingredients, so we recommend staying away from corn, beet pulp, by-products and lower quality kibble. Must have clean fresh water at all times. Training and obedience: Training in the chow must be consistent at all times. The chow is intelligent and very catlike. If rewarded with positive reinforcement, they can excel in any sport from agility, conformation, obedience and lure coursing. Chows when properly socialized, make wonderful family animals, they can run well with other animals and many are used in therapy groups. 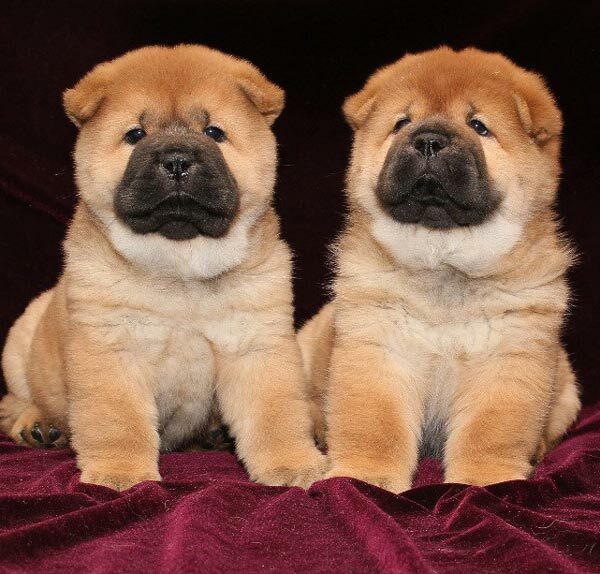 Housebreaking: Chow puppies are typically very easy to housebreak and often are housebroken by the time they leave for their new owners. Chows dislike being around their own waste, and do well with a private area off to the side in which to eliminate. Accicents can occur if this area is not kept clean. Crate training: Like most dogs, chows like to have their own den, and you will often find them in their crates when they wish to be alone. The chow can get quite hot in a short time span, so the crates should never be near a source of heat or sun, and if possible, adequate ventilation can be supplemented with a fan to keep air flowing. Always provide plenty of fresh water to a chow confined to a crate. Exercise: Many chows love running and playing, chasing balls, jogging beside bikes and on treadmills while others are quite content to be very lethargic. It is crucial to keep the lethargic chow on an exercise schedule to maintain proper muscle and body fat levels. It is best to provide constant exercise both on leash and off to keep a well rounded and strong body. Hot days intolerance: Chows need monitoring when exercising, not only due to strain on the straight leg conformation, but to prevent overheating which can happen in seconds if the conditions are right. Always avoid offering large amounts of cold water to a chow who is hot, as bloat is a common occurrence. Instead, bring the dog inside to a cool area and offer small quantities of room temperature water until panting has subsided. Chows are quite clever, and if offered a fan, they will lay directly in front of it to cool themselves off.